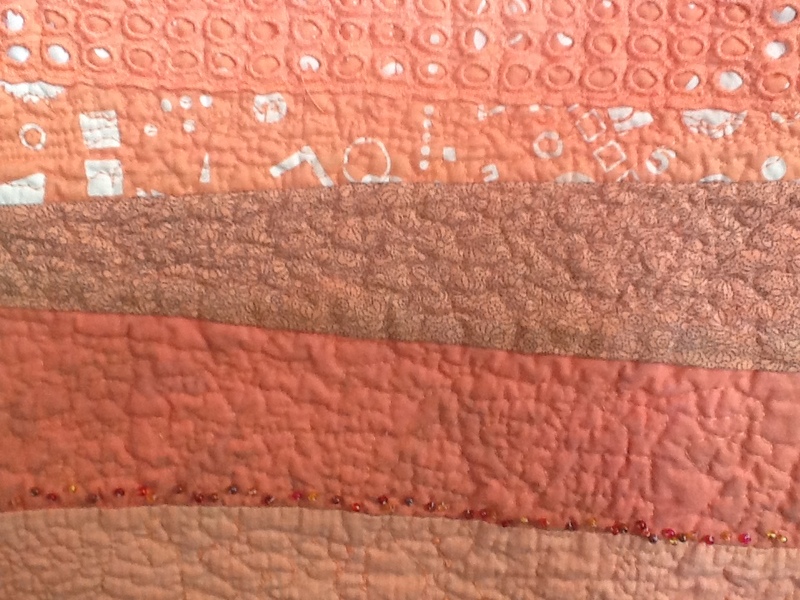 It occurs to me that I still haven’t posted the quilt I made in the Ana Buzzalino workshop that set me off on my current explorations. 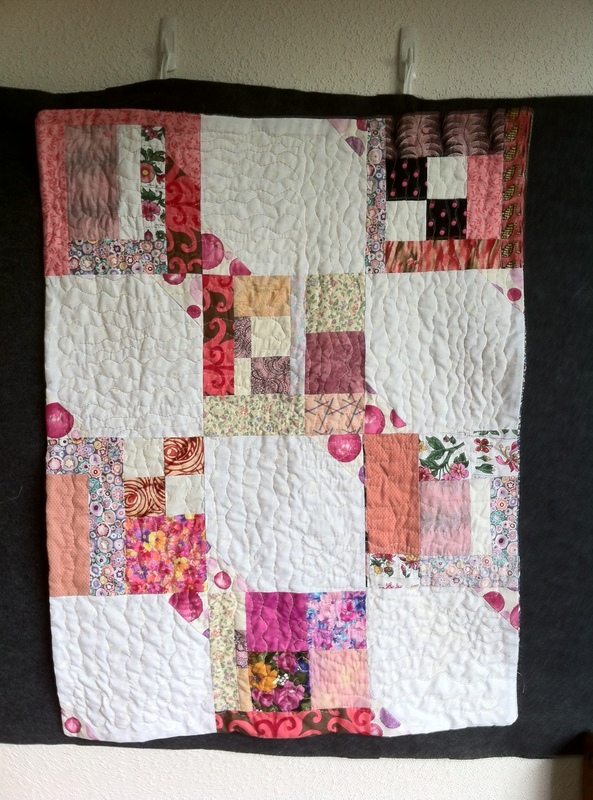 And since it’s the Spring Blogger’s Quilt Festival, this is the perfect opportunity to share. So do hop off over there and vote for your favourites. 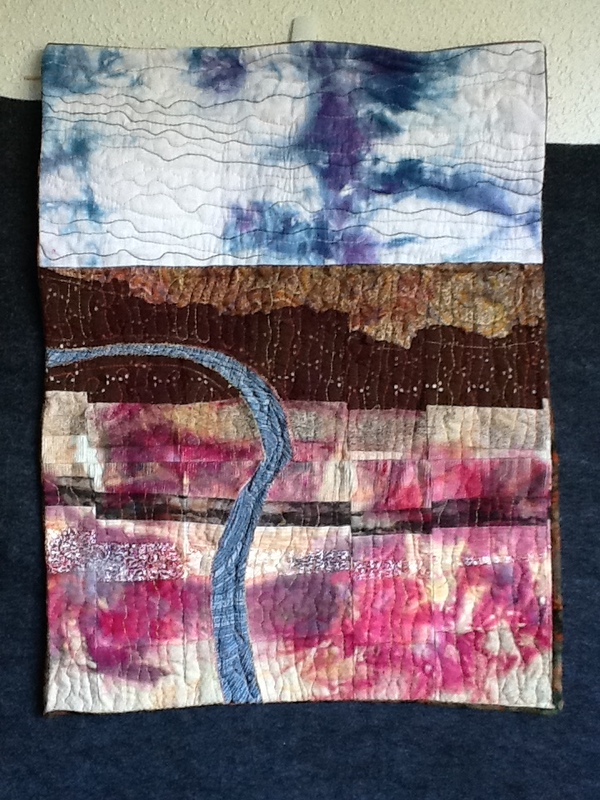 This is in the art quilt category and is 12 inches wide and 39-1/2 long. And on the topic of voting … I put a poll which is just two posts back from this one, requesting artistic feedback, so please feel free to vote on that and help with a current project too. Ana is a very encouraging teacher who brought many of her pieces to the workshop where we could study her techniques as we went along. There were several examples of the Birds on a Wire that we made in the workshop, also others using the technique of piecing mixed fabrics straight onto foundation, batting and backing and then overdyeing the whole piece. Mine includes white on white prints, black and white cotton, broderie anglaise, upholstery fabric, heavy cotton that feels like wool, assorted trims, and seersucker. Some of these were fabrics I never thought I’d really be able to use. I mixed peach and tangerine fibre reactive dye powders from Dharma to achieve my colour. It’s fascinating to see how each fabric dyes differently, yet everything goes well together. This detail shows dupioni silk, a strip of hook tape which I bought for the workshop because it’s polyester cotton blend so I knew it would take some dye. It also demonstrates Ana’s saying that there’s always a fix for everything. A hook fell right at the edge and I had to snip it out to be able to sew the binding down. 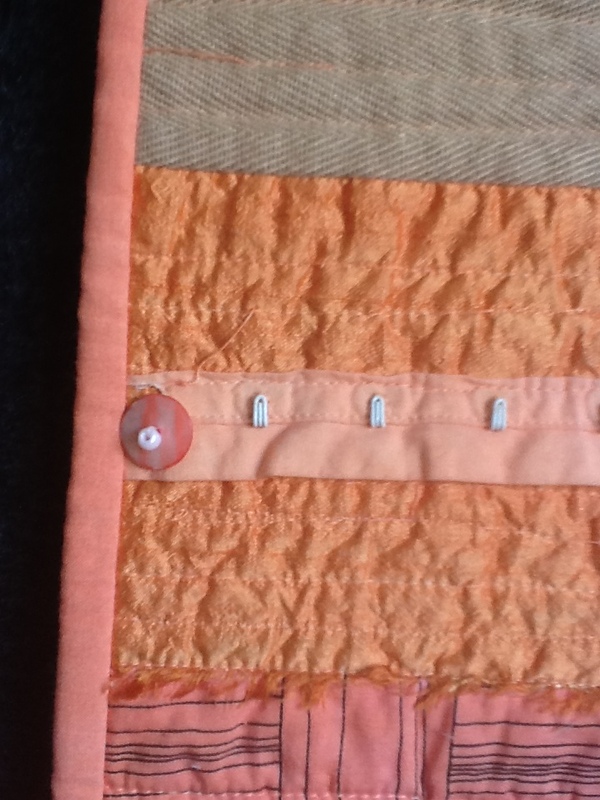 This left an ugly hole because of the way the hooks are sewn into the tape. I found a couple of beads and covered the hole with a trim. There’s a row of seed beads towards the bottom of the piece (below the sitting birds) but sewing through all those layers was quite tough so I left it at one row.